In part 3 we considered the importance Social Media plays in your overall online strategy. In this post we are going to discuss hoe landing pages can be used to convertrt visitors to your website into leads. Now that you have optimized your website, launched your blog, and started promoting content on social media (you did do all that, right?) and now it has been several weeks, you should be seeing a bit of a spike in your website traffic. Now is when we run into another problem. None of that new traffic to your site is generating any new business for you. People are visiting your website but those visits aren’t leading to any new customers or even sales leads for that matter. What now? Easy: Now it’s time to create your Landing Pages and . . .
Perhaps you have heard of a “marketing Funnel”. Right now you are still at the top of yours. You need to move down and start converting your website visitors into sales leads. To do this effectively, you need to come up with a compelling content offer for your prospects. You don’t have to give them the farm, but it should be something they can easily see value in. It can be a list of how to’s or a video tutorial or a list of handy links that would be of interest to your prospects. Once you have decided what to offer, you need to create a call-to-action (CTA) to promote that offer and launch a landing page with a form for visitors to provide their information in exchange for the offer. Finally, you will need to measure and iterate the whole process. Now let’s go over the conversion process in more detail. 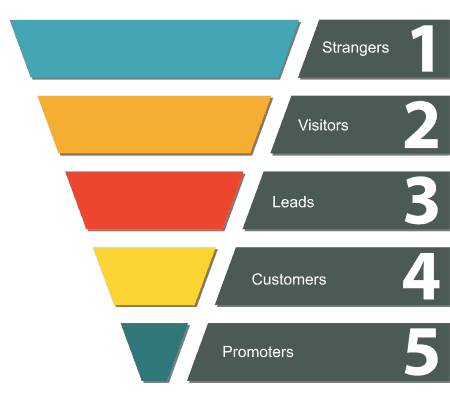 First, take a look at how converting visitors into leads fits into what is commonly known as “Inbound Methodology” This is one of the best ways to turn strangers into customers and even promoters of your business. A gated content offer means you put your content offer, whatever it is, (ebook, webinar, free tools, etc) behind a form. In other words, the visitor has to fill in the form, (usually just name and e-mail address) in order to get to the page where they can actually download the item you are offering. This gated offer is the most important part of any lead generation campaign. 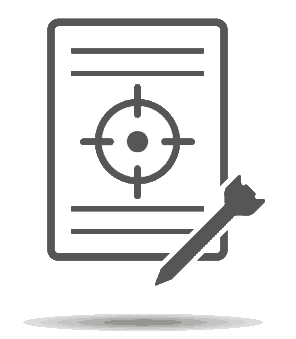 It is the initial attraction that catches the attention of your website visitors and it gives them a reason to fill out the form allowing you to collect their information. It is important to note that this isn’t spam because the site visitor is giving you permission to communicate with them in exchange for the valuable content you are offering. Everybody wins! Your offer should target the type of sales lead you’re trying to attract. For example, if you’re a tennis instructor, you’ll want to create offers that will appeal to tennis players trying to improve their game. If you’re a website designer, you’ll want to create offers that appeal to business owners who are looking to go online with their brick and mortar business or who are frustrated trying to maintain a website that is difficult to use. To ensure you have a solid understanding of the audience you’re trying to target with your content offer, take the time to develop buyer personas. A buyer persona is a semi-fictional representation of your ideal customer, which is based on actual customer data. For example, as a tennis instructor, you might have a buyer persona named “Terry Tennis Player,” who represents your most common type of customer. And through a combination of research, surveys, and interviews, you know that Terry is in her mid-20s, she plays tennis twice a week, and she prefers watching instructional tennis videos vs. reading about tennis tips. Armed with this kind of detailed information, you’ll have a great starting point for creating a targeted content offer. Product-focused offers can include a custom consultation, free trial, or demo of your product. Of course, there’s no reason to be constrained by what’s typical. Use anything you think will work for your target customers. Also, keep in mind that the offer is a conversation starter for the sales team, so it should be designed to start a conversation that will lead to a sale. Once you decide on your offer, create a few compelling calls-to-action (CTAs). As we mentioned earlier, a call-to-action is a button or a link that grabs a visitor’s attention and directs that visitor to a landing page. Calls-to-action are located everywhere: on website pages, in emails and blog posts, within content offers, etc. They are the key trigger behind lead generation. On the landing page, a visitor is prompted to complete the form by entering their contact information and other details in order to receive what’s being offered. Through this information exchange the visitor converts into a lead with who you can then follow up. Of course, not all conversion events are created equal and, as you become more experienced with internet marketing, you will have to start thinking about lead scoring. Lead scoring is a process you can use to figure out who’s really interested in your product and who’ just “kicking tires”. That is a topic for another post. For now, let’s focus on getting more traffic to your site and through your funnel. If you have an effective call-to-action, you’ll convert a high percentage of your website visitors into leads. The folks at HubSpot have a great resource that will help you learn more about call-to-action-design, placement and copy writing. You can see it here: How to Write & Design Compelling Calls-to-Action. The landing page is where your website visitors arrive after they click on your call-to-action, and where they will fill out the form to gain access to your offer. You can use the information you ask for in this form to follow up… provided it’s a quality lead. Keep in mind that once visitors submit their information on a landing page, they should be redirected to a follow-up, or thank-you, page where they can access the offer. Content offers, calls-to-action, and landing pages are the core elements of the conversion process, but you can’t stop there. If you just have a single conversion pathway, you have very little insight into the process and the way it performs. In order to improve your conversion process, you need to constantly measure and experiment. for a month, vary the messaging or swap out an entirely new CTA, and after another month, measure which one performed best. If landing page conversions are low, make a change to the page layout and measure the results. Don’t be afraid to test different variations; you can always switch back if the old version worked better. It will be worth it when you’ve found the best combination that increases your site’s conversions. We hope to write a more detailed post about this whole process in the near future. In the meantime, don’t forget, Google is your friend! Search for “A/B Testing” to get started. That’s it for this post. Next week we will have a look at some things you can try with Paid Advertising. We hope you are enjoying the series. Let us know what you think.